On March 31, Pete Davies and Ross Cowie climbed Jenga (VI,7) on Sail Mhor in the Beinn Eighe massif and finished up KerPlunk (VII,7), a spectacular exit on the left wall. The deeply-cut gully of Jenga has an exciting history and was first attempted by Brian Davison and Andy Nisbet in 1996. Unfortunately Brian dislodged a rock, which caused a stack of blocks to fall on top of him resulting in a helicopter rescue. Brian and Andy returned in March 2000 with Dave McGimpsey and Dave Wilkinson to complete the route, which sports an impressively steep finish. 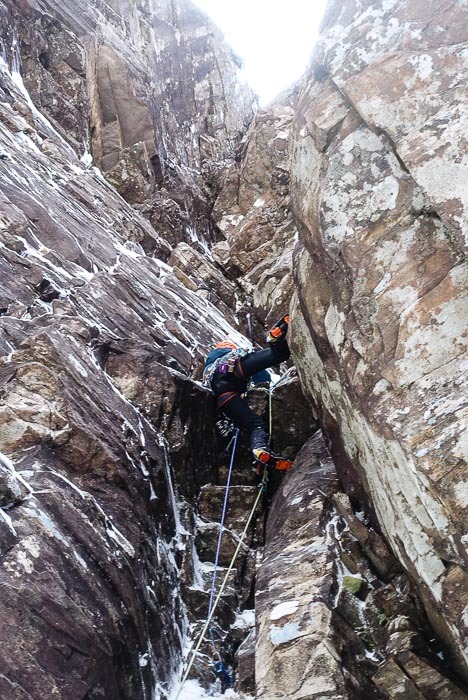 This entry was posted in New Routes and tagged Pete Davies, Ross Cowie, Sail Mhor. Bookmark the permalink. Another significant one I also had on my radar. Well done!